One of our favorite things at City Planter is customer relationships. Having the opportunity to share our knowledge from planting methods and plant care to pest control makes our job more rewarding. As a small business we are proud to be able to teach and share with our customers! 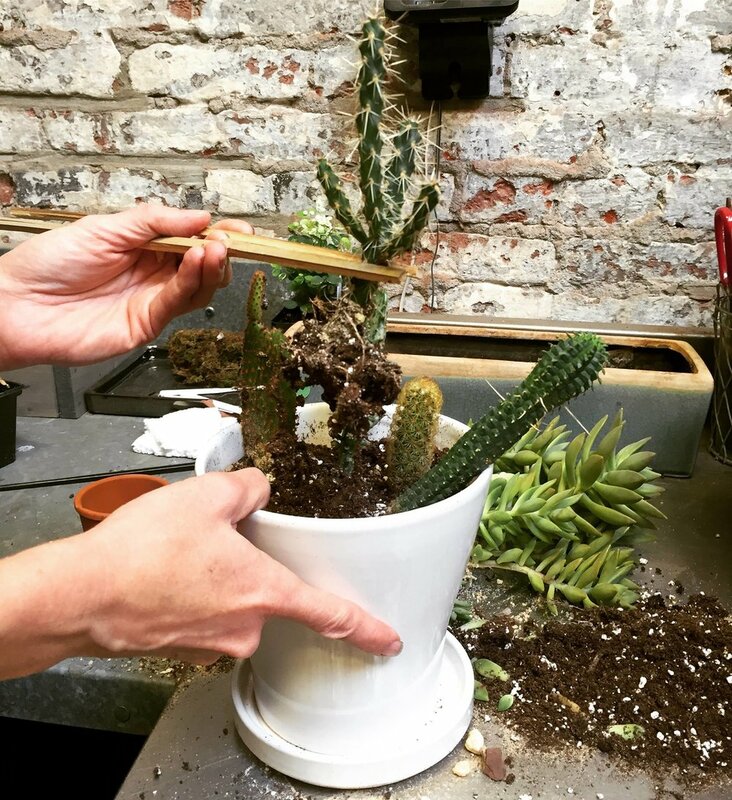 Pictured here is Julie demonstrating a great way to handle those prickly guys- chopsticks ! If you have questions about your plants, or are not sure why your plants are not thriving, please send us an e-mail with a picture of your plant and we will do our best do help diagnose and help you to treat your plants. Look here for additional information on basic and advanced plant care! Are you watering your garden enough? 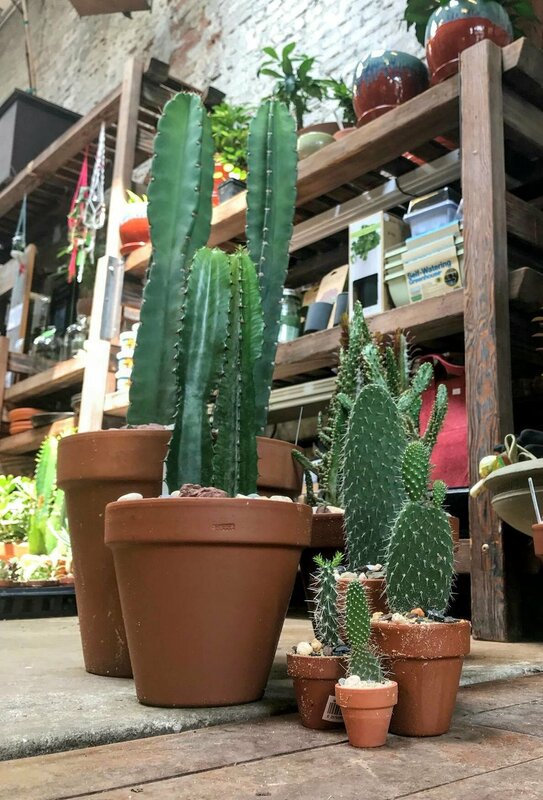 Cactus and succulents thrive in sunny, dry conditions. When watering, thoroughly soak the soil & root system, then allow the soil to go bone dry before watering again. A balanced fertilizer can be added during the spring & summer. When re-potting, use a cactus/succulent soil mix. Container should have good drainage. Provide full to partially full sun light. These plants can live outside until temperatures drop to 50 degrees. Kokedama (meaning moss ball) is a traditional Japanese art form that places plants in special soil wrapped in moss. Kokedama like to stay moist. Water every 2-3 days depending on the dryness of the surrounding environment. We recommend submerging your kokedama in a bowl of water or under a faucet on a slow drip until saturated. Gently squeeze moss to remove excess water. Kokedama can be hung or set in a shallow dish. Tillandsia (air plant) are the largest genus in the bromeliad family. They are native to warmer climates of the Americas. Tillandsias do not need soil and can be displayed in a variety of ways. Water the plant by soaking in a bowl of water once a week for 10-15 minutes. Do not overwater! Avoid watering the flower (if there is one). Mist regularly in between soakings: they thrive in high humidity. Do not allow the plant to sit in water - they should be able to air dry within a few hours of watering. Be sure to shake out the plant to prevent water from collecting in its crevices. Provide bright, indirect light. Do not display in direct light - Tillandsia live under the canopy of trees in the wild and do not like direct sun. Plants will flower once, then they will produce pups (babies) that you can separate or allow to form a clump. Aegagropila linnaei, also known as Marimo or Toresampe, is a unique form of algae that grows into round shapes with a velvety appearance. They are native to fresh water lakes in Northern Japan, Iceland and the Baltics. Keep in tap water at room temperature. Change the water every few weeks. You may turn them every few days to keep their round shape and ensure all sides of the ball are getting light. Photosynthesis occurs in normal indoor lighting or indirect sunlight. If the ball turns gray in an area, flip it & make sure the gray side is getting light. If it turns white, the ball is probably receiving too much light. If the ball turns brown, try cleaning it by gently rinsing under running water.